The very last sentence in the Museum's 1848 edition of New England Popular Medicine: A Work in Which the Principles and Practices of Medicine are Familiarly Explained runs like this, "Many of these things, perfectly familiar to us, were hid in darkness but a few ages ago." 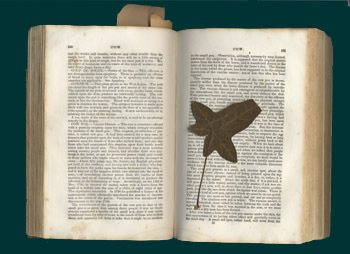 Let me present a few such familiar things that I have found hidden in the darkness of objects in the collections, tucked away a few ages ago with forethought or on a whim, to never see light of day until I stumbled upon them. The inside front jacket of New England Popular Medicine has been inscribed in elegant penciled script, "Capt. E. P. Stimson, Bath, Maine." It was probably taken to sea by Capt. 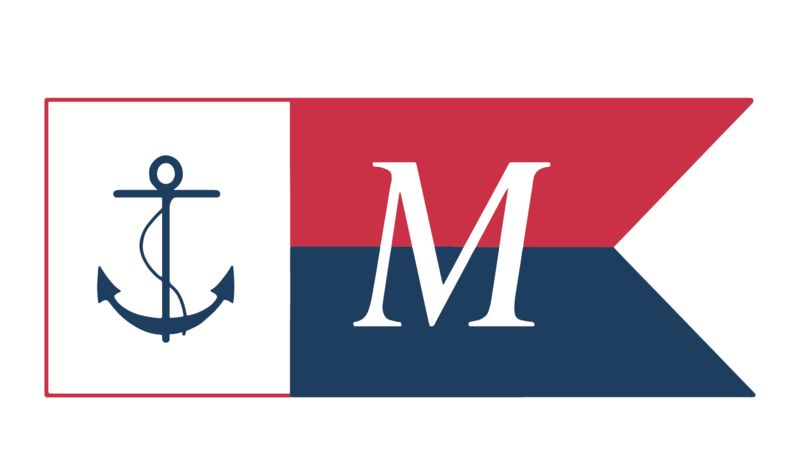 Stimson for advice about medical situations that he would be responsible for resolving aboard ship, far from any otherwise qualified practitioner. It is both detailed and charmingly simplistic; there was little, for example, that could be done about the Plague once aboard, but at least it could be identified. Entries for Amputation, Insanity, Scarlet Fever, and Inordinate Thirst are all considered with no-nonsense brusque fortitude. 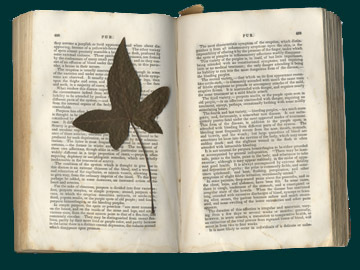 The anatomical references are interspersed with numerous entries relating to medicinal plants and herbs. 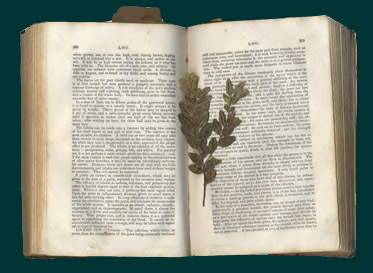 I am not enough of a botanist to identify these leaves, and the plant description on the pages where they have lain hidden is not an accurate match, so it remains a mystery just why and when these specimens were pressed. 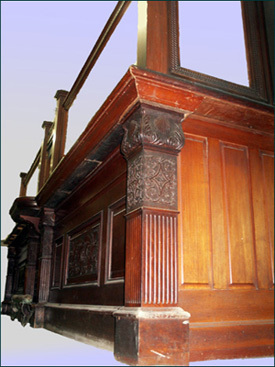 Many years ago the Museum acquired an ungainly yet elegantly detailed mahogany panel and beveled glass counter, ca. 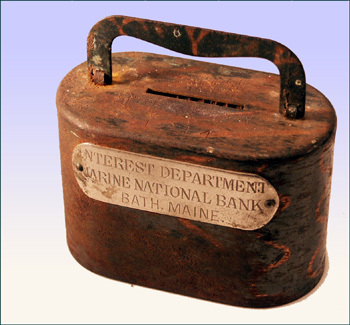 1860, that was the original cashier's enclosure at the Marine National Bank of Bath. Despite the authoritative nickel-plated label, this pressed sheet-metal coin box did not seem large or heavy enough to be of serious use to a bank. The stripey decorative finish, just visible under the corrosion, was puzzling. Closer examination revealed a paper folded inside. 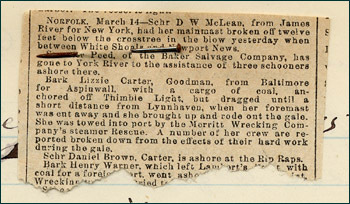 Adroit use of tweezers and fish-hook extracted this receipt from where it had sat entombed since April 1, 1903. The metal box appears to have been an 'auxiliary savings bank' that prospective bank patrons could take home to capture their spare nickels. Philip L. Merrill, who signed this bank out, wasn't much of a saver; the box was otherwise quite empty. The elegant "M.B." monogram of the Marine Bank as carved on the counter paneling. On March 15, 1888, two days after the infamous Blizzard of '88, Woolwich Captain Charles J. Carter has written home to his wife Cassie. He has been 'on the beach' for months in Jersey City, looking for officer's work on any ship out of the port of New York. Pinned to the top of his letter is a newspaper clipping with bad news of the Bath bark Lizzie Carter, of which he and his wife own a share. "My dear wife: a very fine day today but nothing very encouraging to write. I enclose a slip from the Herald which tells its own story. 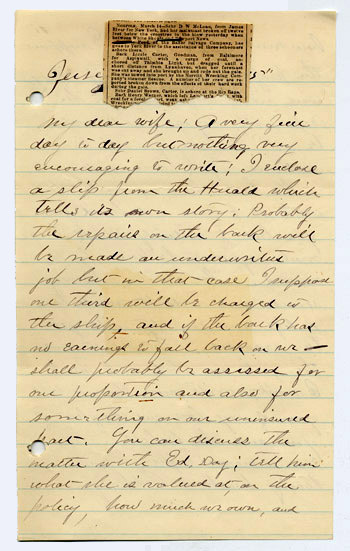 Probably the repairs on the bark will be made an underwriter's job, but in that case I suppose one third will be charged to the ship, and if the bark has no earnings to fall back on, we shall probably be assessed for our proportion and also something on our uninsured part." This storm created catastrophic losses of shipping in the region. Vessel shareholders closely followed the fate and fortunes of their investments. The Carter's were lucky that the vessel was not lost entirely. Even so, this event was the equivalent of their retirement mutual fund tanking. Donations to the Museum Library of large collections of family papers often have stray artifacts mixed in. This kid leather wallet was found among the Sewall papers, a Bath family steeped in Maine shipbuilding and political history. 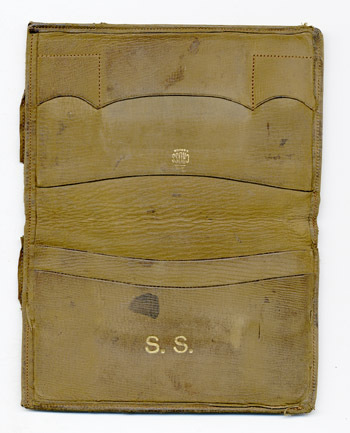 The embossed initials attribute the wallet to Sumner Sewall, a decorated WWI aviator, Maine state representative, senator, and governor of Maine, 1941-1945, when the expanded war effort of Maine shipyards was crucial. 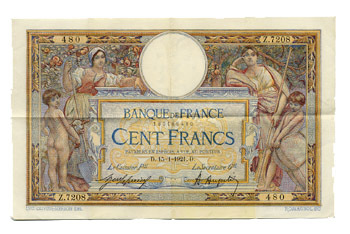 The wallet remained in our artifact collection for a decade before I discovered the English and French currency tightly folded away in an inner pocket. 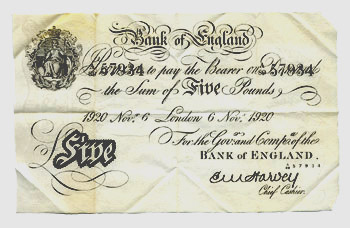 Both notes are crackling new; their respective dates of Nov. 6, 1920 and Jan. 15, 1921 give us a rough fix on the moment that Sewall carefully folded and concealed them, a wise wanderer's insurance. In 1921, he was 24, had survived the air war over France as an ace, and was traveling and working about the world, from Spain, to Cuba, to Mexico, to the Ford Airplane Factory in Dearborn, Michigan. It was a time just before Sewall assumed vocations in banking and the fledgling aviation industry that would ultimately lead to his extensive state political career. He died in Bath in 1965, age 68.